What is the Traditional Muddler? 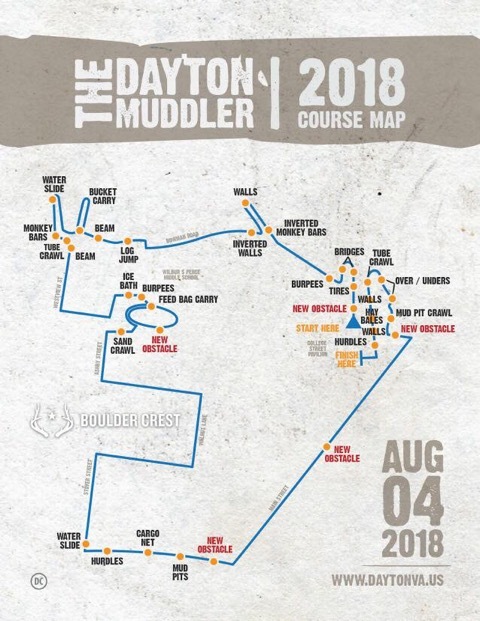 The Traditional Dayton Muddler is the grueling 4 mile endurance mud race in which you will scale obstacles, trek through mud, get wet, have a blast by yourself or with a team. Yes indeed. We’ve done so well organizing our Dayton Muddler for the past many years that we are bringing out an idea that we’ve kept on a back burner. Our ½ marathon will be TOUGH, as it is hilly, some of it on gravel, and held in August, BUT it isn’t as hard as say…what our service men and women are doing on our behalf overseas. Train for it, and you CAN achieve a strong finish. There will be hydration stations and restrooms along the route. This can be done with or without the Muddler option added. I want to watch my friends, how do I get around the course? We usually have a few golf carts shuttling spectators from the most interesting obstacle locations such as the mud pits and ice baths. But we cannot guarantee you will have a ride to see the whole thing. You may well miss part of the course. We recommend bringing a bike along. You can study the course and stay ahead of your runner that way. There is no admission charge for spectators. Where can I find lodging for the event? Dayton is located just south of Harrisonburg VA. A quick web search will bring you multiple chain hotel and motel information. We will be working on getting “Muddler Rates” for you. Keep an eye on our Facebook Page for updates. Hey…our town may not be big enough for a hotel, but we do have some awesome eateries in town! Check out the Thomas House, The Dayton Tavern, and Braithwaite Studio’s, and Hanks BBQ for all your carb loading needs. Is there a drop bag area? Yes. But to be honest, very few participants used it last year because parking is so close. Most left their valuables wisely locked in their automobiles. If you really, really want to drop a bag off there will be an onsite location. Do not bring valuables of any sort to the event. Where do I park to participate in the Muddler? There is plenty of onsite parking (in a field) for this event just north of the College Street Pavilion. If we overflow, or if we’ve encountered heavy rains, parking will be available at Wilbur Pence Middle School which is a short walk to the College Street Pavilion – a 3 minute walk. Like us on Facebook and keep up with our posts concerning last minute changes. What is the maximum number of participants allowed in the race? The Traditional Dayton Muddler is not capped. You sign up, we’ll keep the course open. Pre-registering is strongly encouraged and LESS EXPENSIVE! Call your friends, call your enemies, build a team, or go it alone. Not only does preregistration guarantee you a super cool T-shirt at no charge, but it can save you money. Not that you are concerned with saving money since the event raises money for our nation’s wounded veterans. You can register the day of the event, but this isn’t recommended! If you’ve ever run in an event like this, you know that pre-registration is the best way to go! You can avoid the lines, and the day of the event fee increase! Register now while you are online. Fitness is important, no doubt, and if you have any concerns, please contact your physician. BUT this event is about the cause, and the cause is bigger than our egos. The Traditional Dayton Muddler can be walked if that is your current fitness level, or attack it at a full sprint. Unless you are competing for a 1st or 2nd place finish, you decide what obstacles you will attempt. Bypass those you do not want to climb or jump in. We simply encourage you to participate in whatever way makes you smile. The ½ marathon require that you prepare for it! Is there merchandise such as t-shirts, etc. available? All early-bird registrants will receive a free t-shirt. All other registrants may purchase t-shirts and merchandise the day of the race. May I volunteer for the event? Absolutely. The heart of our run is our volunteers. You earn an awesome shirt, free lunch and admission to the run during our volunteer heats at the end of the race all while giving back to our wonderful charity. There are many different places you can help. Just click on the link below to register and choose the area you’d like to help! Can I view the courses in advance? The courses will be roughly mapped out on the website, but sometimes we need to change it slightly in order to accommodate the landowners who give us the blessing to use their properties. A few days prior to the race we will paint symbols on the road to guide you, and there are volunteers at each obstacle who can point you in the right direction, or hand you a bottle of water. If there is an obstacle that I cannot do, can I go around it? If you are in the competitive heats or corporate cup heats all individuals/team members must complete all obstacles. If you are not competing for a finish, you may go around any obstacle you are not comfortable doing. We will have volunteers to assist at all obstacles, so feel free to utilize their help! But we do understand that certain obstacles may not be overcome. Can I do the course more than once? Yes you may. We encourage this for those adults who have paid the adult fee, but are also wishing to run with the youth division. Just let us know of your intentions so we can mark you with a “may be out of his/her mind” symbol. Once the last group finishes, the course will close for the day. What if I pay in advance and cannot attend. Is there a refund? 100% refund if requested a month prior, 75% refund if requested more than a week prior, and then no refunds for the week leading up to the event. Nope. The Dayton Muddler is rain or shine. You’ll be soaked even if there isn’t a cloud in the sky. Pretty sweet trophies are given to the first and second place male and female winners in all individual competition and youth heats. First place trophies are given to the 1/2 marathon and team heats. The Corporate Cup is awarded to winning corporate team heat. All finishers of the Muddler course will receive an awesome medal. What are the start times, and can I request a start time? You will be able to sign up for specific heats and times are shown as you sign up – however, once a heat is full, it’s full. Opening Ceremonies begin at 0830 hours. It sure will! Some want to be the fastest. Some don’t care about the time at all. Either way, it’s about finishing the race and supporting our Nations Warriors, right? Do teams have to finish together? This depends. Is your team vying for the top time (competitive heat)? If so, teams are defined as a minimum group of five (at least one of the opposing gender) who will be racing together for a team finish. If you are participating in the Team Non-Competitive, you may run a team of any size and gender mix. Many workplaces use the non-competitive registration as a team building event. What are the prices for individuals and teams? Prices are visible in the registration section. There are ALWAYS Early Bird rates, and fees rise as the date nears. How old do participants need to be? 18? We have two youth divisions this year. 12-15 and 11-under. While they will be running the same course as the adults, certain obstacles will be either modified or closed for the little ones. Children under the age of 13 require an adult guardian to run with them. This course isn’t easy and it has several sections that are run on trafficked streets. A parent/guardian must also sign a waiver during registration process..
Is there an age limit or restriction to spectators? There is no limit to the age of spectators, but children must be accompanied by an adult and spectators of all ages MUST stay off of the course and obstacles. No exceptions. Who came up the idea of this race? No one was crazy enough to take full responsibility for this race. Some say it’s the mayor’s idea, some say it’s the chief’s. They point at one another when confronted.